As one of the leading garage floor epoxy companies in Nampa, Idaho, our contractors have the experience and expertise necessary to deliver superior results. Our professional garage floor epoxy installation can transform your garage into a bright, clean, and welcoming space with durable yet attractive flooring. With our team of dedicated epoxy garage flooring installers, you can say goodbye to your dusty and worn-out garage for good. Epoxy flooring is a durable solution that is different than paint. Epoxy resin cures into a strong cross-linked polymer that can withstand all types of damage like chemical exposure, abrasion, puncture, and gas spills that would stain or damage untreated concrete or other flooring systems. Our garage floor epoxy contractors apply epoxy as a thick liquid resin and hardener. When these components are combined, a chemical reaction allows the epoxy to cure. Epoxy flooring is stronger than the underlying concrete and forms a protective yet decorative coating. We love installing garage floor epoxy because it can completely update a garage while creating a hardworking and long-lasting solution. Hobbyist, home mechanics, and homeowners appreciate garage floor epoxy in Nampa, Idaho because it’s seamless, easy to clean, durable, and attractive. Installation is even quick, taking just a day or two. Not sure if an epoxy garage floor coating is worth the investment? Here are some of our favorite benefits of professional garage floor epoxy in Nampa. Our garage floor epoxy contractors have decades of combined experience installing professional-grade garage epoxy. With this expertise and commercial-grade equipment, our epoxy garage flooring installer can get the job done quickly. For most garages, installation takes just 1-2 days plus up to 5 days to cure fully. Despite our fast installation, we never cut corners to properly prepare your concrete floor for superior results. Imagine a garage floor that’s easy to sweep and even mop without the concrete dusting always leaving a new mess to track into your home. 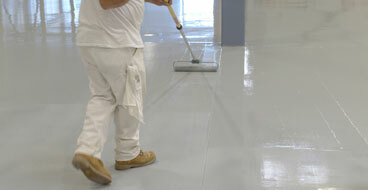 Garage floor epoxy in Nampa, ID creates a seamless floor that can be easily swept and mopped. Garage epoxy also stops concrete dusting for good. Your new floor will also isolate spills and resist stains, even from oil and gasoline. If you have ever used or seen DIY epoxy, you may be under the impression that an epoxy garage floor coating is merely a short-term solution. The truth is professional garage floor epoxy can easily last 10-20+ years with very little maintenance. One of the secrets to a long-lasting surface is careful preparation of your concrete floor. We also use only the highest quality epoxy, not paints with only a small percentage of epoxy. Our Nampa garage epoxy coating formulations are designed to withstand all types of harsh conditions in your garage, from temperature changes and moisture to dropped objects and spilled chemicals. Your new garage epoxy floor resists abrasion, scratches, and damage from cars and lawnmowers as well as moisture, gas, and oil for a long-lasting solution. We make it easy to achieve just the look you want in your garage. Do you want a fire engine red car showroom or a sleek white epoxy floor? Do you prefer a solid color or even your favorite sports team’s logo? What about something unique like a metallic epoxy garage floor that looks like flowing water, lightning, lava, or molten metal? We can bring your vision to life with limitless options to customize your epoxy floor. You want a seamless, smooth, and flawless epoxy installation. 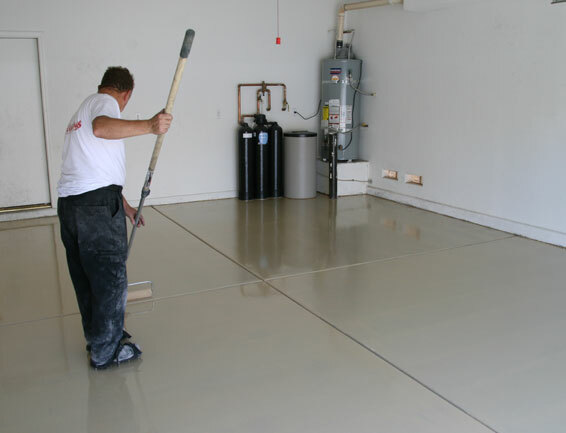 To achieve this, our garage floor epoxy contractors in Nampa, Idaho use a multi-step approach. It all begins with surface preparation. We don’t cut corners. We take the time to correct damage to your concrete, remove surface imperfections, and open the concrete pores with diamond grinding. Stains will be lifted and cracks will be filled to ensure proper adhesion and a flawless final result. Once your concrete is repaired with no cracks or debris, we apply a quality primer to help the epoxy bind. 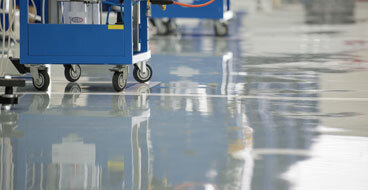 Several coats of high-quality epoxy may be applied to create a durable and long-lasting flooring solution. After the base coat, we will add metallic chips or colored chips to add density, texture, and color while creating your chosen effect. The final step is a clear top coat to add depth and a beautiful glossy finish. Non-slip additives can also be added to the top coat to make your floor safe when wet.